But the Trump who greeted chief executives of Johnson & Johnson (JNJ.N), Novartis (NOVN.S), Merck (MRK.N), Eli Lilly (LLY.N), Celgene (CELG.O) and Amgen (AMGN.O) on Jan. 31 was a surprisingly genial host who even gave them a personal tour of the Oval Office, according to several participants in the breakfast. 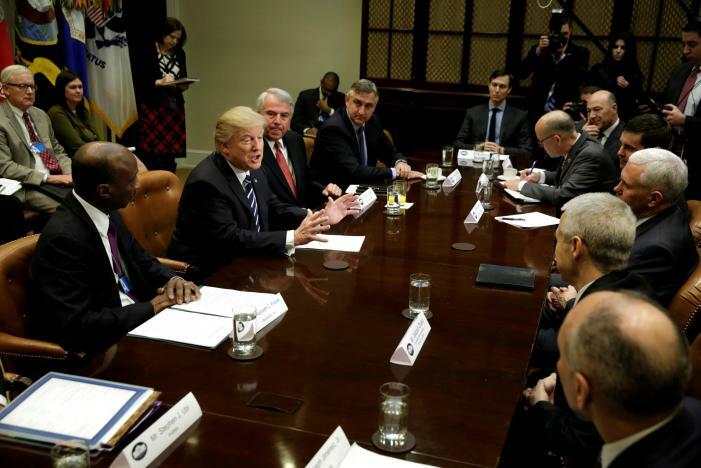 Chief executives of Detroit’s top three automakers – General Motors Co (GM.N), Ford Motor Co (F.N) and Fiat Chrysler Automobiles NV (FCHA.MI) – were pleasantly surprised when they went to the White House for a breakfast with Trump on Jan. 24. GM CEO Mary Barra said in a speech last week that Trump “really listened” to the automakers, while Marchionne told reporters at the Geneva auto show on Tuesday that Trump was “quite willing to make our lives easier” in terms of compliance and taxes in order to encourage U.S. job creation. At another, after Target Corp (TGT.N) CEO Brian Cornell spoke, Trump responded by pronouncing the name of the company as “Tar-Jay,” a common joke to make the retailer sound more fancy. He’s a good con man, but he’s still a con man. Smiling and nodding and shaking your hand with one while his other is in your back pocket. And all you high and mighty CEOs? Just got conned. PS – Ask any stage magician, and they’ll cheerfully tell you that the smarter their audience thinks they are, the easier they are to con. And CEOs of very large companies think they are very smart indeed. J.